Text: From The Stamps of Jammu and Kashmir by D.P. Masson, pp 37-8. The forgeries by private enterprise are comparatively few, and I believe they are of recent date, always excepting the Die I stamps already described. [In circulars] I have seen only (1) a ½a and 1a that are evidently from the same handand which probably had a 4a die also to complete the set, and (2) a ½a that differs considerably from these. The die is very well cut. The central sun resembles a cog-wheel. The first Dogra letter is a perfect figure 3, the upper and lower limbs are about the same shape, whereas in the genuine die the lower limb is crooked up and does not project as far as the upper. The second Dogra letter is straight-backed instead of bent-backed; the left of the three central strokes, instead of being slightly curved, is comma-shaped, and the second and third strokes, instead of being parallel, would if prolonged meet on the outer edge of the central sun. I have the ½a in three colours: (1) blue, like the 1a [following entry], (2) what is meant to be black, but is really a dark brown, and (3) a dull red. Well-printed copies of this forgery can be detected by the two encircling rings. In the genuine stamps the outer ring is light, the inner heavy; in the forgery the outer ring is heavy and the inner so light that it often prints a dotted circle. I have mentioned the square obliterator used at Jammu from 1869 to 1878. I have made a much closer acquaintance with this obliterator while my book has been going through the press, and I find it so specially interesting as to deserve a supplementary chapter. I recognized the impression, amongst a number kindly supplied by Captain Godfreyfrom the many obliterators, mostly of the new rectangular period, preserved in the Treasury at Jammuand the seal itself has since been carefully examined. I reproduce the impression. The inscription reads Mohr Ahan Kan, Jammu, with the date 1915, in small figures at the top. This date corresponds with our 1858, eight years before stamps were introduced in Kashmir, and there is nothing whatever to show how it came to be used for postal purposes. Nor is its original use clear. The translation generally arrived at by persons consulted by both Captain Godfrey and myself is “the seal of the iron quarries,” and the idea is that originally it was for use at the iron mines at one time worked in the Jammu Province. But what makes the seal specially interesting is that impressions from it were used as postage stamps, and this raises it to the dignity of a die. Captain Godfrey showed me an impression, on an undoubted original, where it appears half on the envelope, and half on a small square of plain paper gummed to the envelope to represent a stamp. In this case perhaps the impression must still be considered only an obliteration, in which case the blank piece of paper becomes an unchronicled stamp! 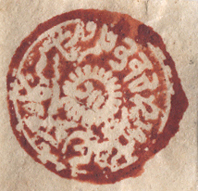 But impressions were also taken in the ordinary red watercolour of the Jammu old rectangular stamps, and pieces of paper having these impressions, were undoubtedly used as stamps. I possess four copies, which puzzled me sorely. They are poor blurred impressions, but I was convinced they were from the obliterator, used as a die, and I often expressed this opinion to my friends. I did not, however risk declaring them stamps until they became chained through Captain Godfrey’s discovery. 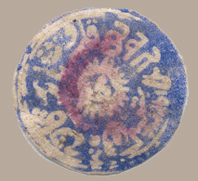 All four were used in September or October 1877, and all are obliterated in the usual waythe same seal thus being used as a die and as an obliterator. The only solution, I can think of is, that about this time the Post-office at Jammuwhere all were postedmust have run out of postage stamps, and been under the necessity of manufacturing them on the premises. Captain Godfrey was assured by old officials that the obliterating seals were used to frank letters when Post-offices thus ran out of stamps, and he has envelopes bearing clear seal impressions, and no stamps, which would support this assertion. But it seems to me that when impressions are taken on separate pieces of paper, in the colours of the correct stamp, and these are obliterated in the usual way, then they cease to be franks and are raised to the status of postage stamps. (1) Old cotton rags, with a mixture of a lettle hemp fibre, are beaten into a pulp at the Harwan water-works. From here the pulp is conveyed to the jail, where it is placed in a large earthen pot, and dissolved in a little water, men puddling it with their feet. (2) Wooden tanks, about 6 feet sqauare at top, and shaped thus V, are sunk into the floor of the jail work-shop, having a water tap at one end. The tank is filled with water, and sufficient of the worked-up pulp is then thrown in, being kept in suspension in the water. On one grated frame (size about 3 ft. x 3 ft). in front of him, on which is laid a mat or screen made of grass, resembling a very fine window chick. The workman dips the frame, with the detachable grass mat on it, gently into the tank, until it is submerged; then raising it up, the fine mat acts as a sieve through which the water drains, leaving a film of the pulp on the screen. The screen bearing the film is then taken off the frame, and is laid face downwards on a board. The screen is then gently unrolled, and the film remains spread out on the board, as a sheet of paper, in size about 2'6'' x 2'6''. This process is repeated, and sheet after sheet is laid over each other until six quires are thus heaped up, which is about a day’s labour. This heap is kept under pressure of about 2½ maunds, all night, to get rid of extra moisture, and in the morning is examined. If sufficiently dry the sheets, still in a damp state, are removed one by one very carefully, and are plastered onto a wall, one over the other, and are carefully rubbed over with goat’s hair brushes. Six to eight sheets are put over each other on the wall, and are left there, adhering to the wall for about two hours, to dry thoroughly. (3) If colored paper be required, the coloring matter must be put in the tank holding the pulp. (4) When dry the sheets are taken off the wall and passed on to a workman, who examines them, rejecting faulty ones, cuts them to required sizes, and sorts them into four qualities. (5) The sheets are then handed over to other workmen, who have gloves made of felted ibex hair, from which the pushmina has been removed. With these gloves they smear the sheets lightly, one at a time, with a past made of boiled rice flour, The sheet is then again hung up to dry, and the same glazing is later repeated on the other side. (6) The sheets are then handed over to polishers, who hand-polish them, using a smooth flint stone, embedded in a piece of wood for a handle. Each sheet is rubbed very briskly on a board of hard wood. (7) The sheets are put up in rolls of 24, and are sold at the following rates: Best quality (Rs 1-0/quire), lst quality (Rs 0-8), 2nd quality (Rs 0-7), 3rd quality (Rs 0-5). The whole process, from the time the sheets are taken out of the tanks till ready for packing, occupies about two days. As regards stamps on European paper, I believe all were printed on laid foolscap, very similar to the paper used for the older Afghanistan stamps.